Aquired by the National Art Museum of Catalonia, Barcelona 1958. Ref: 65502 MNAC. 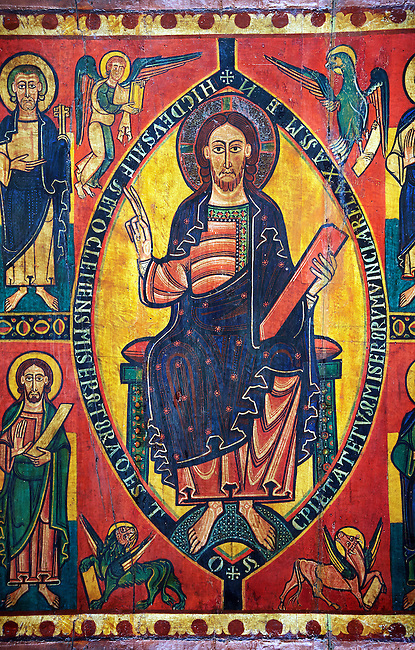 The use of valuable pigments (lapis lazuli, orpiment, cinabri) on the Altar panel, suggests that this front was painted in an important monastery scriptorium like Ripoll. The poetic inscription that runs around the mandorla surrounding Christ is very characteristic of the intellectual environment of Ripoll "This is the God of Alfa and Omega. Come, O merciful with Your mercy, and remove the chains of missery. Amen." This is flanked by Tetramorph showing the four evangelical symbols - St Matthew the man, St Mark the lion, St Luke the ox, and John the eagle. The rest of the panel depicts the 12 apostles.